Well, we went to bed last night with perfect conditions, but when we woke this morning, the winds had picked up and the sea was choppy. Luckily though, it was still calm enough for this morning’s excursions to Jougla Point and Fort Lockroy. Our Zodiac group went first to Jougla Point, where there are some fairly impressive whale bones, as well as several pairs of nesting blue-eyed shags. It’s funny because the shags are the same color as penguins, and are not that distinguishable – that is, until they fly! They also tend to nest higher in the colonies (because they can fly! ), and build their homes of seaweed, feathers and other soft materials. This is in contrast to the Gentoo Penguins that build their nests with rocks. After about 40 minutes at Jougla Point, we swapped with the Zodiac groups that had gone ashore at Port Lockroy. 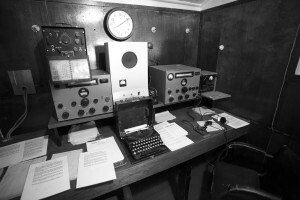 A little bit of history – During the Second World War, the British Government dispatched a secret mission, code-named Operation Tabarin. 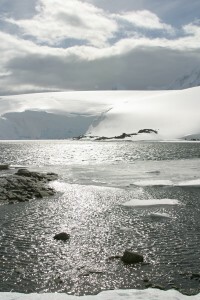 As part of this operation, several small bases were established on the Antarctic Peninsula to report on enemy activities and provide weather reports. “Base A” at Port Lockroy was built on Goudier Island in February 1944. Following the war, the base was handed over to the civilian Falkland Islands Dependencies Survey (FIDS – today the British Antarctic Survey (BAS)). BAS relocated its scientific research to other sites on the Peninsula, and closed the base in January 1962, after which it fell into disrepair. In 1996, the base was restored by the BAS and has since been open to visitors during the Antarctic summer. The four young women we mentioned in yesterday’s post are responsible for opening the structures at the beginning of summer, and taking care of any necessary repairs and maintenance. One also serves as the official mail mistress for the southern most post office in the world, handling about 70,000 postcards each summer. There is also a small gift shop – we managed to spend $165 on momentos, including a fantastic map of Antarctica and numerous post cards. And, of course, I had to have a stuffed penguin!! We named him Neko after Neko Harbour, which was the point where we officially placed our feet on the 7th continent. We pulled up anchor, and made our way south through the Neumayer Channel toward the Lemaire Channel. Just at the entrance to Lemaire, the ice was built up into a pretty thick mixture of icebergs, berg bits and sea ice. The winds were also really picking up, so we waited it out for about 30 minutes to see if the winds died down. The main problem was that with the slow speed required to break through the ice and the high winds, the Captain would have had very limited maneuverability through the narrow channel. The Captain proceeded into the ice at the mouth of the channel. We were moving very slowly – about 3 knots – and I saw a ridge of ice in front of us that looked fairly solid. Sure enough, the Captain made the decision to not to try to proceed further through this “belt”. Well, it was sure fun while it lasted! So, this was to be the most southerly point of our voyage – at 65* 04’ S, for those of you following along on your maps. We were within about 110 miles of the Antarctic circle, which we are told is nearly impossible to achieve this time of the year. We set sail to the north, and returned to the Gerlache Strait on our way to Paradise Harbour. There is another ship, the Expedition (registration Monrovia) at anchor, and so we were not able to accomplish a landing or even cruise the bay in the Zodiacs as they had their own Zodiacs out at the time. Our Captain was in touch with the captain of the Expedition, and got approval to approach a cliff face to observe an area where blue-eyed shags nest. We were on the bridge at this time and were amazed as the Captain and his crew brought the ship to within 15 meters of a solid rock wall scaling several hundred feet above the sea. The First Officer had gone to the bow and we listened as he gave continuous “readings” back to the bridge of the distance to the wall. It was fascinating to be on the bridge and listen to the commands that brought us gently to the very edge of the wall. The birds didn’t even flutter a wing. To put the distance into perspective, the bridge itself is probably about 15 meters wide. The photographers on the bow were probably closer to these birds nesting on the cliff face than they have ever been while on land. We continued to cruise on through the bay, and were about to emerge back in the Strait, when the boat started to turn around. Robin let us know that another cruise ship was scheduled to anchor in Paradise Bay around 7:30 pm. However, they will not be making anchor here this evening, so the Bay was once again open for business. As such, we returned to the Harbour for an evening Zodiac cruise. Our group was set to depart at 8:30, and return to the ship at 9:30 – for the first time we decided to skip an activity. It was very cold outside – about 31*, but the wind chill was much colder. The last few days have been somewhat erratic – trying to find places to land, knowing that the farther south we got, the more ice we would encounter. Lately most of our Zodiac landings have involved motoring through maybe a hundred feet of ice and slush to get to shore and then stepping off the front into a foot or so of ice filled water. The currents, and the wind strength and direction, determine where the ice ends up and more often than not, it seems to end up in the harbors and bays where we want to be. We made our way to dinner around 8:15 – tonight’s theme is Spanish cuisine. After a lovely meal, we took one last stroll on the aft deck. This evening, Mark was wearing his Jimmy Buffett Parrot Head shirt that he received for his birthday (thank you again, Mom and Bob! ), and I thought we should take his picture on deck. 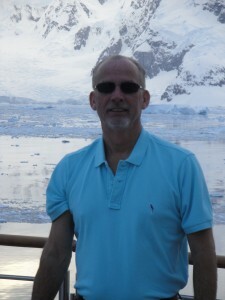 After all, there can’t be that many Margaritaville shirts worn in Antarctica!! You may notice that Mark is not all the way back to the railing. When this picture was taken, it was 32* with a 50 mph wind coming straight at us over the bow – combine that with the fact that we were moving at 15 mph, and according to our “back of the napkin” calculations, that equates to a wind chill factor of brrrrrrrrrrr…. So Mark cheated a little bit and stood in the protection of the aft deck structure. While we were out on the deck, we noticed that the whirlpools have once again been drained – this is not a good sign. So, we retired to our room to administer the appropriate dose of Dramamine and drop off to LaLa Land.